Bugaboo Stamps is on the Moooove again and is happy to be sponsoring this weeks Fab 'n Funky Challenge! This week Fab 'n Funky wants you to to use Blue, Green, and White on your cards or papercraft creations! 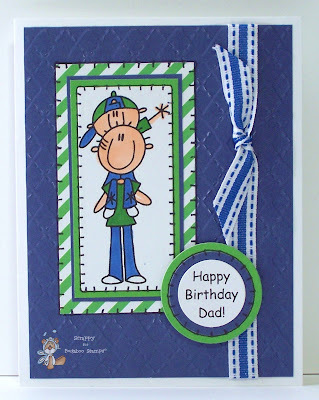 Check out my sample card below featuring AKV Time Well Spent -Dad Piggyback from Bugaboo Stamps! Great card for a guy. The image is touching. So cute - I love blue/green combos! Thank you for joining us at The Stamping Boutique. Awww, this is so cute. What a fab image for Dad! Thanks for joining us at Creative Card Crew. awwww, what a lovely card you got there. father and son. that is the sweetest part of being a daddy - carrying you son and have some fun. keep posting please.